mAadhaar app, which provides an interface to Aadhaar card number holders to carry their demographic information and photograph as linked with their Aadhaar number, in their smartphones, is now available in its latest version. 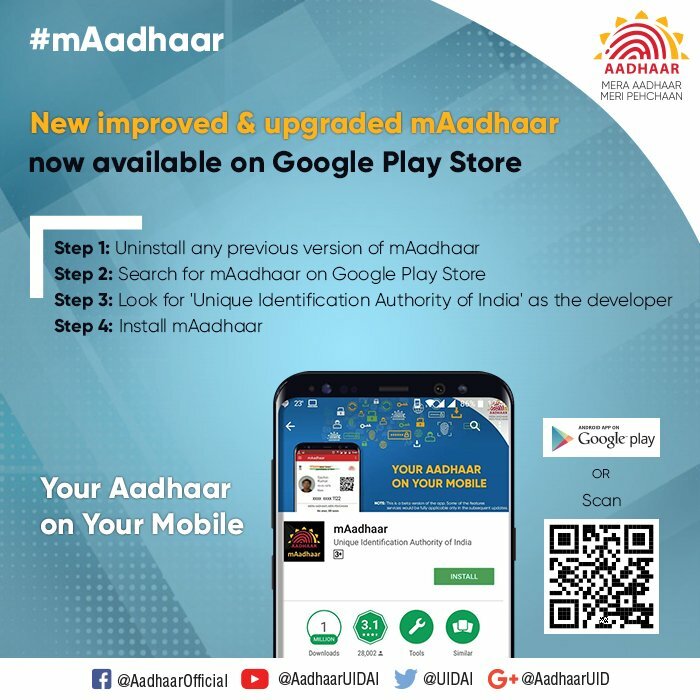 The latest version of mAadhaar app can be downloaded from Google Play Store, said the Unique Identification Authority of India (UIDAI) on its official Twitter handle @UIDAI. mAadhaar app basically helps a user import his Aadhaar profile on his smartphone. In fact, users can also add the profiles of their family members having the same Aadhaar-registered mobile number, said UIDAI. Step 1: If you have an older version of the mAadhaar app installed on your smartphone, you need to uninstall it. Step 2: Search for mAadhaar on Google Play Store. Step 3: Look for ‘Unique Identification Authority of India’ as the developer. UIDAI in another tweet has explained how to create profile on mAadhaar app. 1. mAadhaar app has biometric locking and unlocking features to keep the personal data of an Aadhaar card holder secure. 2. mAadhaar app remains locked once the users enable the locking system till they choose to either disable or unlock the locking system. 3. It works on TOTP (Time-based One-Time Password) generation process, which is an automatically generated temporary password that can be used instead of SMS (short message service) based OTP (one-time password) process. 4. After successful completion of the request, you can update the profiles too. 5. In this app, a QR code and password protected eKYC (electronic know your customer) additional features are also added. Aadhaar card number, the 12-digit unique identity number issued by UIDAI, is now mandatory to be linked with multiple essential facilities like permanent account number, bank accounts, mobile phone numbers, and social security schemes among others. The last day to link Aadhaar card number with these facilities is March 31. Facebook Banned Infowars. Now What?